''Astronomy, by the eminence of its subject and the flawlessness of its theories, is the most beautiful monument of the human spirit, the most distinguished decoration of its intellectual achievement." The only difficulty was to limit the number of astronomers profiled. I selected astronomers who, from the mid-eighteenth century to the mid-twentieth century, made key advances answering the question of our location in the galaxy and in the universe. Their insights and their blunders tell the story of our evolving understanding. I might have made the selection differently in one or two cases, and highlighted other paths to our current understanding. However, I believe that the seven I chose — Thomas Wright, William Herschel, Wilhelm Struve, William Huggins, Jacobus Kapteyn, Harlow Shapley, and Edwin Hubble—cover the territory that was most important to include. I have found that Edwin Hubble is the only astronomer in this list that most people have heard of. Hubble was indeed an outstanding figure, most deserving of having a space telescope named after him. He established that our galaxy is only one of many galaxies scattered throughout space, and he found evidence that the universe is expanding in all directions. But it is only in the context of developments in the 200 years preceding his career that we can fully understand his accomplishments and the reason for his fame. The story begins in the mid-1700s with the Englishman Thomas Wright, who was not so much an astronomer as a somewhat eccentric philosopher. Wright appears to be one of the first people to have thought carefully about the three-dimensional structure of our stellar system, which we call the Milky Way galaxy but which, in those days, constituted the entire known universe. He also pondered the question of whether there might be other stellar systems, or other universes. His ideas inspired other philosophers to consider the problem. Not long after Wright promulgated his ideas, William Herschel, a Hanoverian who made England his home, began what was arguably the first scientific attempt to map the stellar system. Herschel, one of the greatest observers and telescope-makers in the history of astronomy, ventured to trace the contours of what we now call the galaxy. Unfortunately, he could not put any scale on his map, as the distances to the stars were not known. Establishing the distances to some of the nearer stars was the work of Wilhelm Struve, the nineteenth-century astronomer in Russia's imperial observatory. Struve was among the first to measure stellar distances by the method of parallax. An admirer of William Herschel, Struve also tried to continue Herschel's research on the shape and extent of the galaxy, although with limited success. William Huggins (there are a lot of Williams or Wilhelms in this septet) is a transitional figure who approached the study of the heavens from a completely different perspective. In the mid-1800s this self-taught amateur applied the new technique of spectroscopy, which gives information on chemical composition to the light emitted by objects in and outside our galaxy. Spectroscopy opened up new vistas in astronomy, and in fact led to the development of the so-called ''new astronomy,'' the combination of astronomy and physics or astrophysics. The discovery of the shape and extent of our galaxy, and of our galaxy's place in the cosmos, would not have been possible without the insights that spectroscopy brought. Jacobus Kapteyn, a Dutch astronomer of the late nineteenth and early twentieth centuries, took advantage of the new information gleaned from spectroscopy and updated Herschel's mapping technique. His representation of our stellar system, which became known as the ''Kapteyn Universe,'' required a lifetime of patient effort to put together. The Kapteyn Universe was an important model of the distribution of stars until the 1910s, and some aspects of it survived beyond that period. The American astronomers Harlow Shapley and Edwin Hubble, contemporaries who were notorious rivals, provide the denouement in this account of our discovery of our place in the cosmos. Shapley astounded the astronomical world in the 1910s with the news that the ''Kapteyn Universe'' was only a small part of a vast galaxy. Hubble, a successor of Shapley at the Mount Wilson Observatory in California, established that our galaxy was beyond doubt only one of many similar systems of stars, or galaxies, scattered throughout space. The word ''galaxy'' is a familiar one. Today even elementary-school children know that we live in a galaxy—a system of billions or even trillions of stars, bound by gravity and orbiting a massive center—and that our Sun is one of the lesser lights in the Milky Way galaxy. One can even buy T-shirts showing stars in the classic whirlpool pattern, with the words ''YOU ARE HERE'' and an arrow pointing to the Sun's location in one of the spiral arms. How do we know we live in a galaxy? Many of my students seem to think we know because we have seen pictures of it. This is not an unreasonable assumption in light of the stunning photographs collected by the Hubble Space Telescope and other ground-based and satellite-based telescopes. 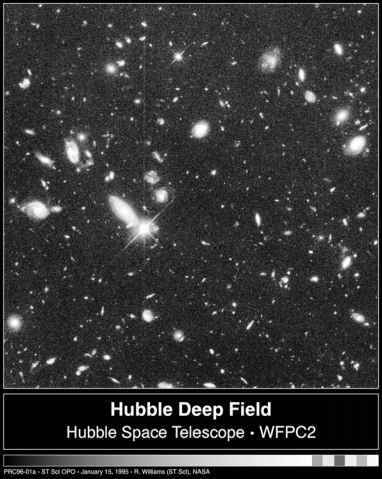 In the so-called ''Hubble deep field'' photograph, for example, space looks positively crowded with galaxies (see figure 1.1). There are a few bright points in this image that represent foreground stars, but the rest, yellow, blue or reddish in color, are galaxies. Some are wide, flat spirals that we see nearly face-on, presenting a disklike appearance. Some look spherical. Some appear as thin lines—these are the disk-shaped galaxies seen edge-on. The variety of colors stems from the different chemical compositions and ages of the stars making up the galaxies, and the presence of dust and gas clouds among the stars, which lend a reddish hue to the galaxy. What we know about the shape and size of our galaxy emerged from the efforts of many astronomers, beginning in the late eighteenth century and culminating in the early part of the twentieth century. Detective work of an astronomical sort was required to make sense of the available information. The problem of studying our galaxy from within it is like trying to learn about a crowd of people from a vantage point inside the throng. 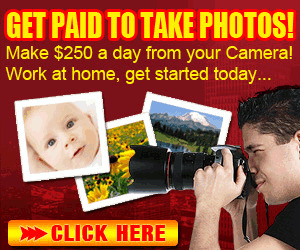 Consider, for example, that you are part of a graduation procession at a large school. Looking to your left and right, you might see only one or two neighbors, while the head and tail of the line may be out of sight. Clearly you are in a line of people, but your perspective gives you only limited information about the size and shape of the procession crowd. Similarly, from our vantage point in a spiral arm of the Galaxy, we have some information about the nearby disk, while some parts of the galaxy are obscured from view. And to complicate matters, astronomers have had to devise methods of estimating distances that allow them to gauge the extent of the starry congregations without leaving the surface of the Earth. The most important clue to the distribution of stars is the phenomenon we call the Milky Way. The term ''Milky Way'' has two possible, related meanings: it refers to our home galaxy, and it also means the misty band of milky-white light we see arching across the sky (figure 1.2). Residents of countries in the northern hemisphere see the Milky Way band of light most prominently in the late summer, fall, and winter. 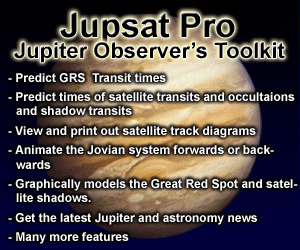 Southern hemisphere observers see it best in spring and summer. correctly inferred that the misty glow of the Milky Way is nothing other than the combined light of these stars, much more tightly condensed in this region than in other parts of the sky. For him, the question of the Milky Way was nicely settled by this telescopic view and left no more to wonder about. ''All the disputes which have vexed philosophers through so many ages have been resolved, and we are at last free from wordy debates about it,'' Galileo wrote in his popular booklet, the Starry Messenger. ''The Galaxy is in fact nothing but congeries of innumerable stars grouped together in clusters. Upon whatever part of it the telescope is directed, a vast crowd of stars is immediately presented to view, many of them rather large and quite bright, while the number of smaller ones is quite beyond calculation. ''6 Galileo also noted that several other ''nebulous'' or cloudy patches of light could be seen scattered about the night sky, and that the telescope revealed these, too, to be groups of stars. For more than a century after Galileo's pronouncement, few astronomers or philosophers seem to have been interested enough in the Milky Way to suggest that more could be learned about it. What intrigued Thomas Wright, the first person profiled in this book, was what the crowding of stars revealed about the system in which our Sun is embedded. As we shall see, Wright imagined various configurations that our stellar system might have—for example, the stars might be arranged in a spherical shell — that would result in the view we have of the Milky Way. By Herschel's time already, astronomers understood that the stellar system or galaxy has the shape of a watch, wide and flat. Not until the twentieth century, however, did astronomers have the means to map our own galaxy reliably from within. The crowding of stars in the narrow band of sky we call the Milky Way suggests a fundamental asymmetry on a grand scale: the stars do not lie scattered equally in all directions. For reasons that may never be completely clear to us, for we have the advantage of hindsight, observers and philosophers alike overlooked this clue to the structure of the stellar system until the middle of the eighteenth century. Galileo complained about the philosophers' ''wordy debates,'' but these disputes referred to the nature of the diffuse light of the Milky Way, not to the structure of the system of stars. Early astronomers pictured the stars distributed on the surface of a solid sphere. 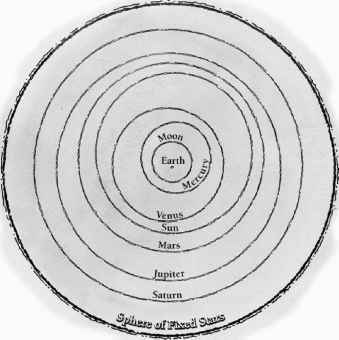 In this scheme, which originated in the fourth century BCE (before the Christian era) and which Aristotle and Ptolemy developed through the second century BCE, the Earth occupied the center. The Moon moved in a sphere encompassing the Earth, and the Sun and planets orbited in their own successively distant spheres. The last planetary sphere was that of Saturn. The whole system came to an abrupt end at the sphere of fixed stars (see figure 1.3). In the third century BCE, the Stoic school of philosophers imagined a modified system in which the spherical realm of stars lay embedded in an infinite void. The Stoics essentially stripped away the Aristotelian outer boundary to avoid the problem of defining an edge to space. For centuries, philosophers preserved the essential symmetry of the Aristotelian system even as they modified the details. 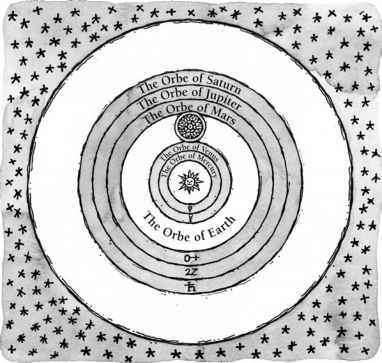 Both Arab and Western Christian scholars elaborated on the moral correlate to the physical system, associating the outermost sphere of stars with a divine mover and the terrestrial center with all that is mortal and impure. distribution of stars in space was more or less uniform and symmetrical. Whether they imagined the stars as fixed to an outermost sphere or dispersed in an endless space, astronomers found little reason to dwell on them as anything other than a fixed and rather uninteresting backdrop to the more changeable elements of the night sky. Until the nineteenth century and even beyond, astronomers devoted far more attention to the wandering of the planets, the transient appearance of comets, the occasional bursting forth of a ''new'' star, and to small irregularities in the Earth's orbital motion around the Sun than they did to the stars per se and to the possibility that they might be distributed in some structured way. The theory of island universes—which has been around in some form for a long time, but which philosophers and astronomers debated with renewed vigor in the eighteenth and nineteenth centuries—draws attention to the difficulty with the word ''universe.'' To most of us, it means ''everything.'' The universe consists of hundreds of billions of galaxies, and a lot of dark, mostly empty space in between. The universe in this sense is the cosmos, including both what is known and observed and what is unobserved. But in earlier times, it often meant the system of stars we see around us; before the term ''galaxy'' became current in the twentieth century, astronomers referred to our system as the universe. Thus in 1914, when the great English astronomer Sir Arthur Eddington wrote a book on Stellar Movements and the Structure of the Universe, he meant the structure of what we would now call our galaxy. But in 1933, he used the term in its modern sense when he wrote The Expanding Universe. The theory of island universes states that systems of stars, or galaxies, are scattered at great distances from us, like islands in an ocean of space. Some philosophers, like Thomas Wright, saw the existence of other worlds as a natural consequence of an infinite cosmos. In his Original Theory or New Hypothesis of the Universe, printed in 1750, he wrote that ''we may conclude in Consequence of an Infinity, and an infinite all-active Power; that as the visible Creation is supposed to be full of sidereal [starry] Systems and planetary Worlds, so on, in like similar Manner, the endless Immensity is an unlimited Plenum of Creations not unlike the known Universe. 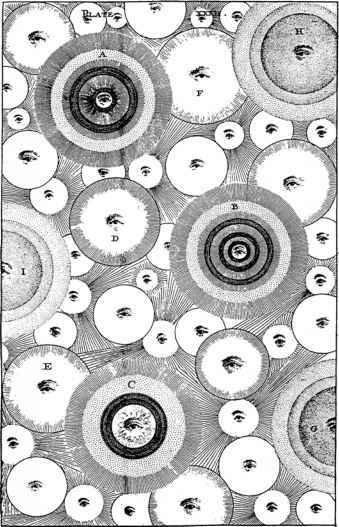 ''7 Wright attempted to draw some of these creations, or ''a finite view of infinity'' as he called it (see figure 1.5).8 His creations or universes are not all alike, but each has a supernatural or divine center, represented by an eye. In some of these island universes, one can discern a spherical shell of stars, Wright's preferred conception of the Milky Way system. Immanuel Kant, the German philosopher who gave the idea much currency (although not the appellation ''island universes,'' which came later), suggested that some of these creations or starry systems might be visible to us as cloudy patches in the night sky. Galileo had shown that the diffuse light of the Milky Way arose from innumerable close-packed stars, and in a similar way, Kant and others supposed, distant island universes composed of stars like our Sun might appear as milky disks or circles. Kant was not far off the mark: as we shall see in chapter 2, a few of the nearest galaxies do appear as cloudy spots, even to the unaided eye. The story of our discovery of the Milky Way and other galaxies is in many ways the chronicle of the popularity, demise, and renewal of the theory of island universes. None of the astronomers whose work is described here could study our own galaxy without thinking about the ramifications of his conclusions for the island universe theory. The theory of island universes itself is a minor character in the drama of our understanding of the Milky Way and other galaxies, always in the background, sometimes moving into the spotlight. Only very recently, in the middle of the twentieth century, did we come to appreciate the size, structure, and even the history of our spiral disk galaxy, the Milky Way; and we learned at the same time that our magnificent system has its counterparts both near and far, in the billions of galaxies stretching into remote space and distant time.